Kverneland 3628 FT/FN – 3632 FT/FR/FN – 3636 FT/FR, Front mounted mower conditioners with SemiSwing steel tines, nylon tines or roller conditioning. Working widths of 2.81, 3.18 and 3.57m. Front mounted mower conditioners with SemiSwing steel tines, nylon tines or roller conditioning. Working widths of 2.81, 3.18 and 3.57m. 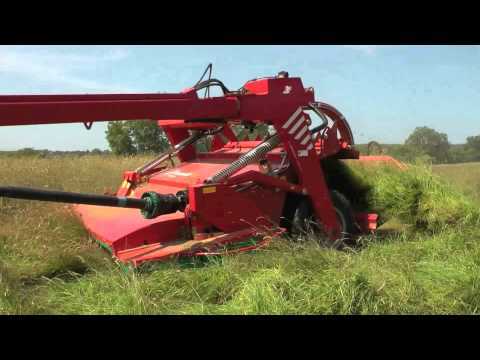 Kverneland 3600 front mounted machines can be used in combination with a variety of mower conditioners, including the 4300 series, 3132 MT, the 5090 MT, or on its own, making these extremely versatile machines. With a working width of 2.80-3.60m, the capacity of these machines is substantial. Working Width Number of Discs Conditioner Power Requirements, min. The Kverneland ActiveLift system ensures maximum protection of the cutterbar during operation. If hitting a stone or foreign obstacle, a three-fold action takes place simultaneously. 1. The cutterbar will move back and up, due to the geometry of the suspension. 2. Tension in the ground pressure springs increases, adding additional lift to the mowing section, which helps to clear the obstacle. 3. The angle of the cutterbar repositions from 4° downwards to horizontal, for better clearance of the obstacle. The suspension design has been redesigned to offer even better flotation and more even ground pressure. The two large suspension springs have been moved further outwards to provide better side stability, which is reflected in optimum protection of the stubble and far less skid wear. The moving pattern of the machines is extremely flexible, allowing downwards movements of 250mm and upwards of 420mm. This ensures excellent adaptation to uneven ground contours and higher reachable speed. The Kverneland roller versions are equipped with full width chevron rollers, quickly taking the cut crop off of the cutting discs and providing gentle and effective conditioning of fragile crops like lucerne/alfalfa, reducing leaf loss to a minimum. The design of the rollers ensures, that the crop is placed in an even, fluffy swath. The conditioning intensity is varied without use of tools, by adjusting the roller pressure exerted between top and bottom roller. Due to the nylon tines fitted to the conditioner, the total weight of the machine is kept to a minimum, while keeping an aggressive conditioning. The fixed conditioning fingers are made from high quality nylon, to make them very rigid. This means excellent protection from stones and other obstacles. A perfect solution for farmer and smaller contractor machines!